Three stars of Rivazzurra facing the sea, the Hotel Vela d'Oro is the ideal accommodation for young people and families. It has a garden, parking, mini club and entertainment for children. It admits pets of all sizes and offers them specific services. The hotel is located in Rivazzurra, a fraction of south Rimini full of services and shops. Positioned on the front line, it allows you to reach the beach without crossing roads. Nearby, the Fiabilandia theme park can be reached in about 10 minutes on foot. Recently refurbished, the rooms can accommodate up to 4 people and feature: balcony, air conditioning, satellite TV and digital terrestrial television, private bathroom, hairdryer. STANDARD: can accommodate up to 3 people, side sea view, shower curtain. FAMILY MAGNOLIA: walk-in balcony, soundproof windows, WI-FI, safe, desk, fridge on request, shower cubicle, folding box or wall shower. SUPERIOR VELA: lateral sea view balcony, WI-FI, independent air conditioning, minibar on request, bathroom with shower box (also foldable). SUPERIOR ORO: balcony facing the sea, WI-FI, mini-bar on request, safe, folding shower box. 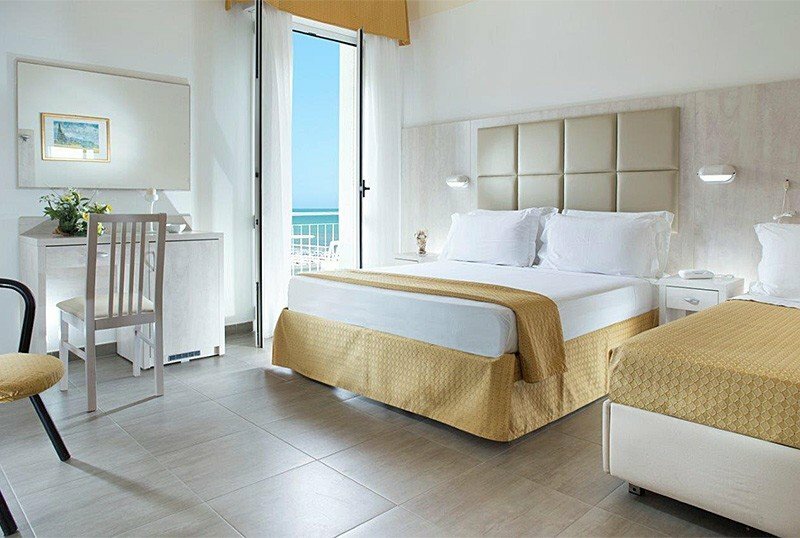 JUNIOR SUITE: more spacious than the rooms, it enjoys a beautiful side sea view; it consists of a double bed and a bunk bed with the possibility of adding a cot. It has a large bathroom with shower, telephone, air conditioning, WI-FI, safe, desk, fridge. Garden, sun terrace, reading room with newspapers, lift, laundry, night porter, luggage storage, late check out on request and beach towel in use for those staying in All Inclusive. Organize theme nights. PARKING: covered and uncovered, available for all customers and free in Top All Inclusive formula. WI-FI: available for free in the common areas and in the Magnolia, Superior Vela, Superior Gold and Junior Suite type rooms. AIR CONDITIONING: all the rooms are air-conditioned at no additional cost. AGREEMENTS: beach, amusement parks, discos, spas, gym, swimming pool, waterslide and organized excursions. PETS: animal friends package (scratching posts, bedding, bowls, mental activation games, pet carriers, muzzles, leash and much more, designed for the well-being of your faithful playmate) on request. LUNCH AND DINNER: buffet style, typical local cuisine with pasta and homemade desserts. VARIATIONS: available vegan and vegetarian dishes. In hotel: indoor and outdoor playground area, entertainment, mini and baby club, babysitting service and pediatric consultancy. At meals: baby menu, baby food and high chairs at the table. On the beach: entertainment and playground area. The hotel, in addition to admitting pets, offers them a series of dedicated services: bedding, bowls, games, scratching posts, pet carriers, muzzles and leashes. The hotel has an agreement with the nearby bathing establishment Bagno Dino n.114 and with Bagno Dario n.115. The establishments are equipped with sports fields, entertainment for adults and children, a playground area, nursery, newspapers and newspapers available and a fitness area. Prices per person per day in full board. FREE children up to 2 years if sharing a room with 2 adults. 1 child FREE if in room with two adults. FREE Children's Offer up to 6 years from 25/05 to 14/06 and from 08 to 14/09. Children up to 2 years always FREE in Latvian with parents (excluding the week of August). Offer of April 25th Hotel Package directly on the sea in Rimini. Evening with the Mascotte del Vela d'Oro! Book even 4 nights from May 24th to May 31st and Save! Rooms with Balcony, Car Parking, Internet Wi fi.